How many progressive Christians grimace a little whenever they hear about Baptists? To be fair, some of the most vocal among them present a less-like-Christian and more-like-Republican worldview, so this reputation is not terribly surprising. But as is often the case when we generalize, we miss out on the image of Christ in our neighbors. Behind all the politicking, gay marriage-banning, you’re-going-to-hell preaching that we hear about in the news, there is a sincere desire to do what all Christians want to do: follow Jesus. Baptists hold a belief system that I cannot subscribe to. I do not see the Bible as the inerrant, complete Word of God. I do not believe that congregations should hire and fire their clergy. I believe in a unified liturgy. Yet though I disagree with these and other fine points of doctrine, I refuse to enter that debate over whose faith tradition is better. And I will also listen when Baptists have good things to say, and they very often do. So in the spirit of ecumenism, here are some Baptists who have done good work for God. Martin Luther King, Jr.: Duh. Of course I’m going to include the patron saint of civil rights and nonviolent resistance. One cannot admire King without acknowledging that it was his career as a minister that launched his civil rights work. 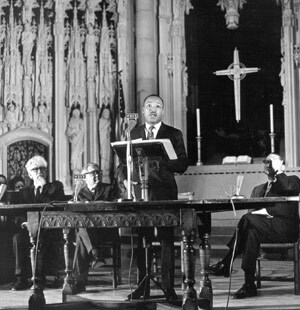 When he was not leading the Southern Christian Leadership Conference in marches around the South, he was giving animated sermons at Ebenezer Baptist Church in Atlanta. If you get the chance to visit the Martin Luther King, Jr. National Historic Site, be sure to include Ebenezer in your visit. The congregation now meets across the street in a bigger building, but the original church is owned by the National Park Service. In the sanctuary, have a seat in one of the pews and close your eyes as you listen to recordings of his sermons. It’s quite an experience of history coming to life. The “I Have a Dream” speech was a sermon given to a congregation of a quarter of a million people, putting today’s megachurches to shame. 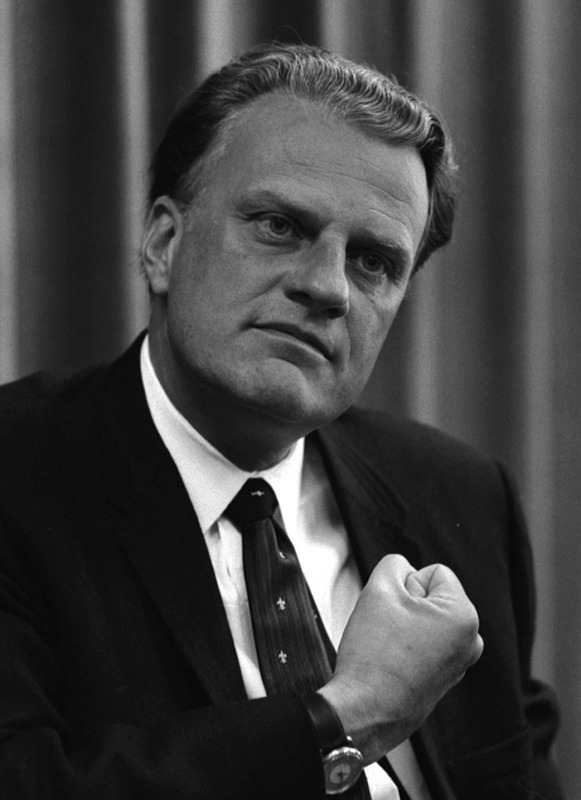 Billy Graham: I remember a conversation with my dad years ago, in which an adolescent me did what I did best: announced to anybody who would listen what (or who) I didn’t like. Somehow, we were talking about little old ladies who donate their money to Billy Graham. In my righteous indignation, I condemned Graham as an Elmer Gantry (or I would have if I had yet seen Elmer Gantry) who was preying on simple-minded people. Dad calmly told me that Graham’s sermons were a good thing for these people. When I read a biography of Graham years later, I realized that he was right. I should forgive myself. As a Catholic, in my childhood I could not wrap my brain around the idea of televangelist preachers who were politicians and adulterers. There were plenty of both back then. But Graham is not one of these. Perhaps Graham’s greatest spiritual asset is his complete devotion to preaching the Gospel. There are finer points to his theology, to be sure, but he has spent most of his life simply working to bring people to Jesus. His crusades have included the involvement of Christians all over the denominational map – including Catholics. And he has not been afraid to step out of the mainstream to get on the right side of history, as he did in 1952 when he announced that he would stop holding segregated crusades. Sadly, Graham’s message is not being passed on. His son Franklin has hijacked the Billy Graham Evangelistic Association, using his father’s name to take on political culture war issues such as gay marriage. But as a former BGEA staffer wrote in the Huffington Post, Graham did not step into these issues during his active ministry. Like Graham, Stanley does not use his pulpit as a political podium. Rather, he talks about our relationships with Christ and each other. (You know, Christian stuff.) The attentive listener walks away with a deeper understanding of Biblical teachings. 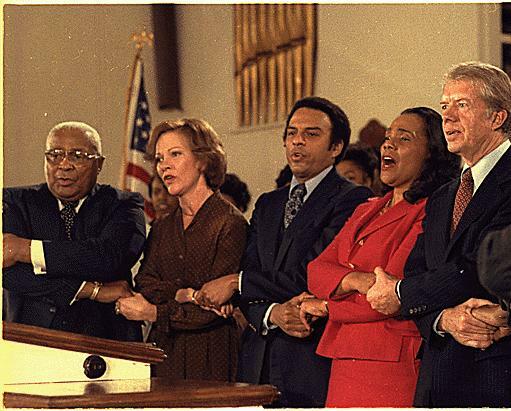 Jimmy Carter: I tend to avoid politicians when seeking spiritual leadership, but president Jimmy Carter is an exception. You might say he is much better at being a Christian than a president. His advocacy towards peace and work with Habitat for Humanity have certainly given him some God cred. But did you know that he also teaches Sunday school at his church in Plains, Ga.? 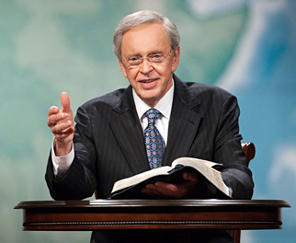 Carter (who sounds kind of like Dr. Charles Stanley) has tried to stick with his Southern Baptist Convention upbringing, but doctrinal issues such as a ban on female pastors has led him to quit the denomination. Twice. Randy Miller: Don’t worry if you’ve never heard of Pastor Randy Miller. He leads a small Southern Baptist congregation that used to meet in a high school cafeteria and now meets in another Southern Baptist congregation’s church. But he stands out for me because he was the one who showed me that Baptists are Christians, too. 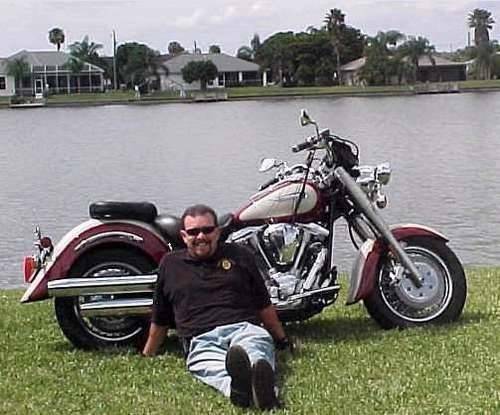 About a year ago, as I was starting my gradual return to faith, Daybreak Fellowship in Cape Coral, Fla. was my first stop. Thanks to 13 years of Catholic schooling, I had little experience with how the “other” side lived, so visiting a Baptist service was big step out of my comfort zone. Thankfully, the hellfire sermon that I expected never materialized. After leading the congregation in singing some praise music, Pastor Randy delivered a sermon about Jesus as the Light, and how we are called to be reflections of that Light. What a beautiful concept! Though I did not become a Baptist, my devotion to ecumenism was born in that small Baptist service. This entry was posted in Spirituality and tagged Bible, Billy Graham, Christianity, communication, ebenezer baptist church, Martin Luther King Jr. by Dave Montrose. Bookmark the permalink.